Great leadership by VP Pence. Kudos to him for giving the NFL a chance, and walking out on a disrespectful circus. Turning your back and leaving an issue isn't great leadership. That is the sign of a coward who would rather run from an issue than confront it. I've wore a uniform for damn near every day for the last 17 years. If my first line leader, Commander, First Sergeant, Platoon Sergeant or squad leader turned his back and ran from an issue instead of confronting it he wouldn't be in that leadership position very long. Pence has absolutely no interest in fixing anything and he proved that this weekend in one of the more cowardly actions I've ever seen from some one in that position. Its unfortunate that this administration is so fueled by division and hatred as they have the platform to help. Instead they are doing a lot of damage and making the division in this country even larger. OK. This is because of your polkte request, and because of my debt to you for founding this site. Two links, both intertwined, IMO. But then again, what do I know? The 49ers were well known for having a fairly large number of players kneel during the National Anthem. This was not a sudden protest, as when VP Pence was confronted from the stage after a performance of "Hamilton". That was unexpected. This was totally predictable. You can draw your own conclusions. Because there is a lot of misinformation out there. And increasingly, we make up our minds, and simply find sources that agree with our preconceived ideas. As "The X Files" was fond of saying, "the truth is out there". But so are a thicket of lies, misrepresentations and exagerrations, all offered as facts. A Veterans of Foreign Wars (VFW) in Florida has canceled its National Football League (NFL) subscription amid the ongoing protests of the national anthem at recent games. "There’s a time and a place to voice their options about anything at all and that’s what America stands for, if you have an opinion, you are permitted to voice it any way you want but not at other people’s expense,” Blydenburgh said. The VFW post canceled its subscription just days before Vice President Mike Pence left an Indianapolis Colts game on Sunday against the San Francisco 49ers after players from the California team kneeled during the anthem. "Somebody had to give these players, students, rioters and the others a little USA history lesson since they didn't get it at home, school and now even places of employment. What better man than OUR President Donald Trump. Respect has great importance in everyday life. As children we are taught (one hopes) to respect our parents, teachers, and elders, school rules and traffic laws, family and cultural traditions, other people's feelings and rights, our country's flag and leaders, the truth and people's differing opinions. The President of the United States is not a coward, like the previous one, to tell it like it is, not just this about our nation's flag and anthem, but in many other things that were not previously addressed. The players have the Constitutional right to protest whatever they wish to protest. They do not, however, have the Constitutional right to do so on the stage provided for them by the NFL. If the NFL allows them to protest on the field, that is a privilege afforded them by the NFL, not a right granted by the Constitution. If the players owners et all really want to respect OUR flag and National Anthem before any sporting event they will stand with one hand over their heart facing the flag, NOT WITH LINKED ARMS!! Now the Packers and their players asked the fans to join them in linking arms during the anthem??? In other words by doing that you are with us and approving!!! Not only did the Packers’ weak attempt to get the entire stadium to interlock arms during the anthem, flop, the ratings for Thursday Night Football crashed again, as more Americans decided they’d rather not be told how their ruining the world by a bunch of hypocrites. These players and coaches are supposed to be role models for our children! Unfortunately it kind of shows you where we are or headed! It's the dawning of a new day like it or not. I have no problem with the NFL players wanting to demonstrate against something. The problem is they are taking advantage of their place of employment on football days in uniform and are disrespecting our flag, national anthem and most importantly all the men and women who gave their service and many many who gave their lives for our flag and Country. Here are couple of thoughts.... why don't the players on their days off go out in the stadiums parking lots, or rent a venue of their choosing and hold rallies, in their street clothes and link arms, kneel or whatever else they want to protest or...start some charities that would benefit their concerns...how about visiting some of the oppressed areas in our Country they are championing for and do something good for the people there. I'm sure the players can come up with some more examples where they can help. Here's another thing....where were all the libs/dimms and protestors before President Trump was elected? I'll use an old military term, MIA, missing in action! How sad the left is!!" Agreed. VP Pence did indeed spend a lot of taxpayer flying to the game which he knew he'd face something he found offensive. 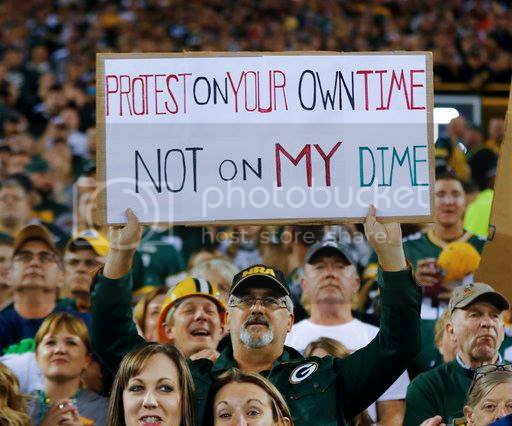 So, if he wants to protest protests, he should, indeed, 'do it on his own time, and not on my dime', as a taxpayer. That was my contention, and nothing I read by LMG has challenged anything I wrote, or linked. Anyway, apparently the NFL is going to install a rule forcing the players to stand during the Anthem. Will that appease anyone? Nope. The next thing will be that players who didn't stand should be banished from the league. Now you are spinning Ricky. Go back and read what I had underlined...it means the so called protests are being carried out in the wrong venue. Fans come to stadiums to watch football not to watch players disrespect our flag, national anthem and the men and women who have served and died so that we remain free. The 'sign' was made way before Sunday's game. How exactly is Donald Trump qualified to give anyone a history lesson? In his 71 years what has he ever done that was patriotic for this country? He openly bragged about not paying taxes and using tax code loopholes. Is that sort of behavior patriotic? Did he serve? No, used almost a half dozen draft deferments to do everything in his power to keep himself from serving. Is that Patriotic? Is trashing and trying to humiliate POWs, insinuating that their service to their country means nothing because they were prisoners Patriotic? Please don't say its because he's President because you showed what very little that position means to you with your attacking and trashing of President Obama. Make no mistake about it, Donald Trump is a coward that could give two shits about this country, that flag or the military. Just because he was an up and down business man that made a lot of fans being an a-hole reality TV star doesn't mean he's qualified to give anyone a history lesson. I've got no interest in communicating with memes as its like communicating like a junior high student. So again, what exactly qualifies Donald Trump to give anyone a history lesson on what that flag means to this country, vets or the Military? I'll put this here. Its unfortunate the amount of hatred that has been spewed at this veteran for the suggestion he's made. Just shows the massive amount of hate that fuels the alt-right or republican base. I've served for the last 17 years and the division in this country makes me sick to my stomach. Though I can see through the very strong and VILE hatred that is being spewed, it makes one question his service to this country. We are in a sickening state right now that is only being made worse by the divisive manner this administration is attacking this country's issues. Please tell me that the picture you posted LMG was ironical... right??? The Green Bay Packers never lost a football game. They just ran out of time. This veteran doesn't "shout out" just getting my view out. Not sure when that pic was taken but don't think during the anthem....to many hats on and people smiling...or maybe laughing at the players. SSG...Your anti-view of President Trump is very clear and that's OK...the First Amendment is also clear...for ALL people. So don't pull the lib/dimm typical response to shout down other opinions because YOU don't agree with them. The reason President Trump called out the players, who obviously with the NFL's approval were holding their protests in stadiums on game days in uniform, was because nobody else would tell them to stop because they were disrespecting Country, flag, national anthem and men and women in service and veterans which you say you are (thanks for your service SSG). If the players owners et all really want to respect OUR flag and National Anthem before any sporting event they will stand with one hand over their heart facing the flag, NOT WITH LINKED ARMS or on a knee!! Let me ask this from one vet to another...do you kneel in or out of uniform in uniformfor the national anthem because you disagree with President Trump? Everyone is standing looking up. Too many hats on? Larry, come on man, I know you have attended many games in your life. Many people do not remove their hats, hell plenty are horsing around drinking and shooting the breeze during the anthem. I stand and put my hand on my heart (I sometimes might even smile), unless I am in uniform - then I salute, but my service was about serving our country and freedom (not the flag that Trump uses for retail purposes) - including the respectful protesting of kneeling hand on heart or linking arms. Who is this guy to lecture and give history lessons, this guy who between 1964 and 1972 received five deferments — in addition to his "bone spurs" claim, the other four were based on his educational status. He received two deferments while he attended Fordham University from 1964 to 1966, and two more after transferring to the Wharton School at the University of Pennsylvania. This dodger who questions and insults McCain's service and sacrifice, including being a POW in the war Trump avoided. "I like people who weren't captured." Was he being honorable when he publicly disrespected Khizr Muazzam Khan and Ghazala Khan, the gold-star Pakistani-American parents of Army captain Humayun Khan, who was killed in combat in 2004 and posthumously awarded a Purple Heart and Gold Star for his bravery? Larry, I certainly support and respect your right to your opinion. I would even stand with you, hands on our hearts and sing along while facing the flag during the anthem. However, I will not remove my support and respect for players and coaches right to express theirs promoting equality, justice, and life, liberty and the pursuit of happiness. Even when it is done in tax subsidized stadiums during the national anthem. No where have I said that the players, or anybody, does not have the right to protest have I? My problem, and of a lot of fans, it is the platform they chose to air their protests....game days, in uniform disrespecting out Country. The players can spin this this anyway they want but they are being disrespectful!! The NFL has no backbone as they are only worried about the money they are now losing and will try and gloss this over and hope the fans negative responses make it all just go away. The fact is, these athletes do not have the “right” to protest at football games unless their employers consent to the conduct,” adding how their private employers had every right to suspend the players who protested during the playing of the national anthem. Lot's of good things posted on this thread. This includes the original poster's post despite the fact that I'm on the other side. I find it stunning that the same people are complaining that the protesters don't appreciate their freedoms are advocating for those freedoms to be taken away. I'm not as frightened by Trump as I am frightened by the 1/3 of the country that supports him. I think the US is at risk of a fascist coup. So no... I wouldn't agree that we are the most free country in the world either. I think we're a border-line police state with 40 gun deaths every day, the greatest percentage of its citizens incarcerated, poor healthcare, income inequality equal to that of many third-world countries, unending war, failing infrastructure, oligarchy, and refugees fleeing north to Canada. This is what the protests are about... not about disrespecting those that serve.